If you’re like me, you have met someone that you love more than anything else. More than your favorite movie or TV show, more than your favorite comic book or video game, even more than that one 90s thing. And so you’ve seen the photos floating on Facebook of Marvel wedding cakes and anime wedding receptions and thought, “What if we did something like that?” Well on April 29th, 2017 I married the love of my life and we did something just like that. So read on and find out how we geeked our wedding and get some tips on how you can too. First of all: don’t. When I asked my various friends for ideas, this was the most common response. It can be tempting to inject a bit of something you love into your big day, but anything more than a bit is too much. You might really love Harry Potter, who doesn’t? But your grandma and boss don’t want to go to a wedding in the Great Hall of Hogwarts with robes and ghosts and a toad choir. 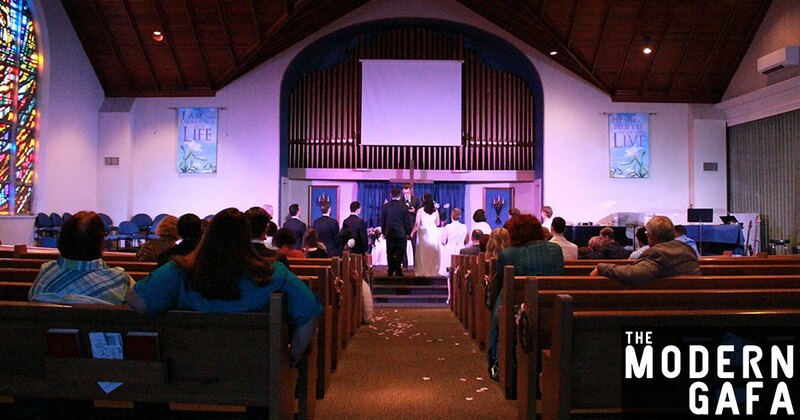 Before the standard bridal march, we walked down the aisle to Hikari, the instrumental theme to the PS2 classic Kingdom Hearts. We walked out while All is Love from Where the Wild Things Are played. And… that’s it! Hikari is basically classical music. Sure, the song is from a video game where anime kids team up with Disney characters, but its musical theme is still a classical orchestra piece. I don’t even think my parents really comprehended that it’s from a video game. All is Love is from a movie about a bunch of weird monsters, but it sounds like a simple, sweet love song. Our reception is where things got interesting: it was at an arcade. Victory Pointe is a two-floor arcade with the best milkshakes in Pittsburgh. The first floor remained mostly the same with all of their games available for our guests to play throughout the evening. 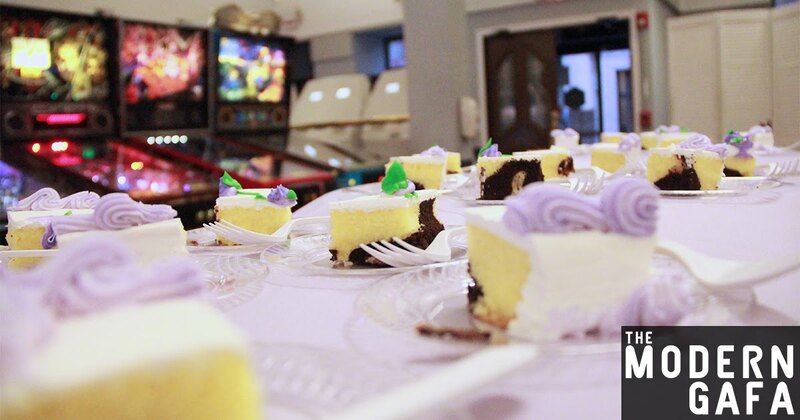 The second floor, which usually houses their console and tabletop games, was completely cleared out and able to hold about seventy people, plus a buffet, dessert table, and dance floor. Click here to find out more about Victory Pointe. We’re friends with the Victory Pointe staff, so they communicated with us the whole way through. At one point they asked us if we wanted anything video game themed in the reception. Nope. The reception was at an arcade and that was it. The food and drinks were typical (yet Puerto Rican inspired) wedding fare, the decorations were simple and elegant, and the cake looked like a wedding cake. Although that last part was more our style - I think your cake is a great place to let loose and show off your geeky side with unique designs and toppers. We had the expected confusion at first. “You’re doing it at an arcade? Waaaah? You can’t do that.” But everyone came around, especially when they saw the place, and were convinced it was a great idea. The term “different” came up a lot. That’s my main tip: don’t try explicitly to be geeky, be different. Katrina and I both like games and gaming, but it’s hardly our geekiest obsession. The arcade was great because it was different. It was a fun place for cocktails and we know the staff so we were able to get exactly what we wanted. But there are plenty of subtle approaches you can take. As with our Kingdom Hearts processional, there are plenty of instrumentals that don’t scream “geeky” but are still geeky at heart. You may say you don’t want to use an instrumental, which I get. We originally used a 3-minute version of Hikari, but it finished up too early in rehearsal so I got the longer version instead. You want something that gives enough breathing room. If you’re going for a short song, it better be high energy because the wedding party is going to need to run down the aisle. This is where people tend to go the most overboard. I have seen pictures of weddings where EVERYTHING was built out of Lego bricks. I love Lego as much as the next guy. But don’t do that. Keep it subtle, keep it simple. If you want to make Lego centerpieces, don’t also have Lego tablecloths and a Lego disco ball. This is your wedding, not your 6th birthday party. Dinner should be dinner. Bread, meat, veggie, potatoes, pasta, etc. I have nothing against getting it catered by Pizza Hut or Wendy’s either. But you don’t want your caterer (or you) to slave over the stove making chicken nuggets shaped like Disney characters. Save the subtle and simple fun for appetizers, cocktails, and dessert. Dessert especially gets an easy pass, decorating cookies and cupcakes can be super fun. If you’re not having a full open bar, most will recommend you just beer and wine with one signature cocktail - that signature cocktail can be whatever you want. If you are the kind of person who wants Batman to give you away at the altar, you’re probably young, think you’re cool, and find the usual wedding traditions are outdated. You’re someone I like. You don’t have to throw a bouquet or anything like that. Most states have a very, very bare minimum for what constitutes a wedding so it still counts if you don’t use “Here Comes the Bride” or say "I do." Pennsylvania doesn't even require a minister! 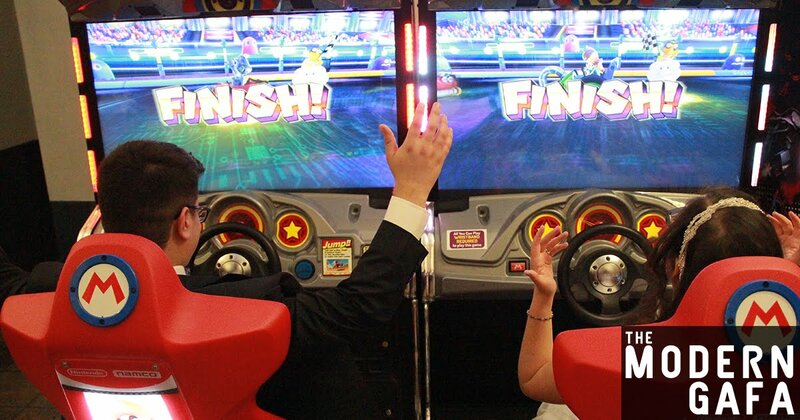 After our First Dance, we also had a First Mario Kart Race, which held way more people’s attention. Especially because I totally won. As thank you gifts to my groomsmen, who were all my brothers, I got them all a retro game that I have childhood memories of playing with them. My wife gave her bridesmaids autographed books. I say it’s good to keep things balanced. 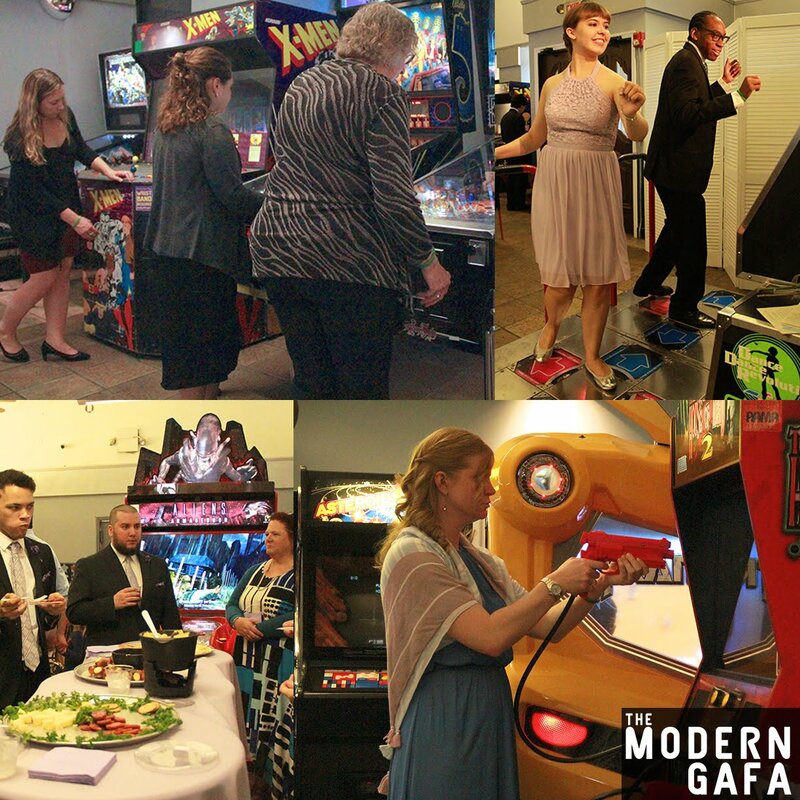 Our reception was at an arcade, but the fairly traditional ceremony was at a church. If you’re going all-out on the ceremony, keep the reception simple and vice versa. And remember the subtle/simple rule. Museums, libraries, aquariums, science centers, and the like make for excellent venues that are fun and different and can be geeky. If they’re in your area and in your price range, I highly recommend booking a castle or a famous movie shooting location. One thing we were told constantly was that the wedding wasn’t “our” day. It was for everyone. It was a family reunion. I sorta half agree. I’ve heard many wedding horror stories from couples who basically threw a huge, expensive party for other people and had no fun for themselves. There are ways to have fun on your day without upsetting three generations on two sides. During the wedding planning phase, many young couples forget that you’ll get a whole trip of just the two of you. We had our honeymoon in Orlando and got to party with the X-Men and go to Hogwarts and eat cheese balls and popcorn. You can have your day be geeky, but don’t go overboard. You have the rest of your life together to be a couple of huge dorks. Check out our honeymoon in Orlando. Thanks for reading! 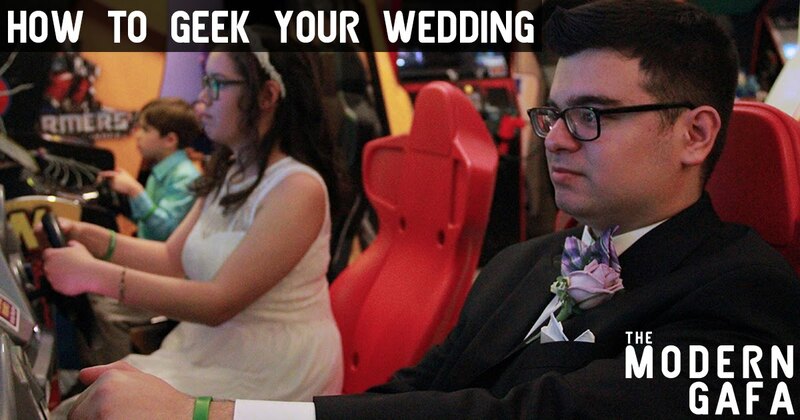 How would you geek your wedding? Let me know in the comments below! Wow!! Good to see this awesome wedding post. For my wedding at one of Los Angeles wedding venues planning to hire a wedding planner that will really help me to have something best for the day. Will hire a photographer too.